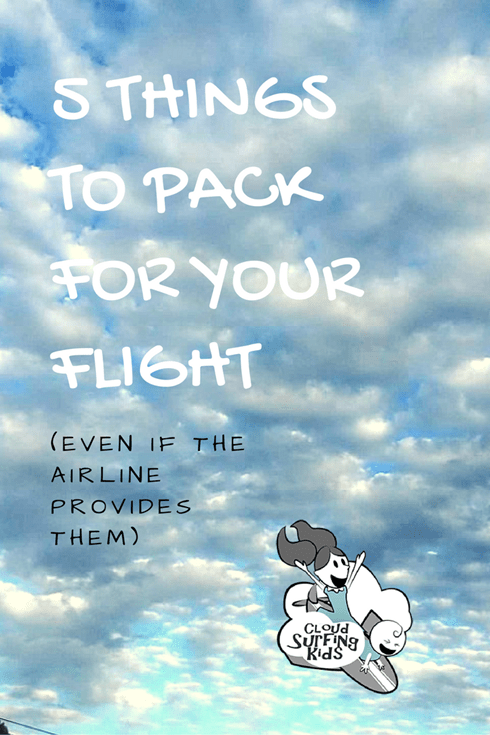 For this week’s Tuesday Travel Tips, I’m going to share with you 5 things you should always pack, even if you expect them to be provided by the airline. As a flight attendant my job is to provide both service and safety. Most of the time I am able to provide the service that passengers expect, but there are times when things go wrong. Either I’m not given the provisions I’m supposed to have or there is a mechanical issue. When I’m flying as a passenger I make sure to always pack these 5 things for myself, even if the airline provides them. Be prepared with these essential comforts and you will give yourself a better chance of enjoying your flight. The Boy Scout motto, “Always Be Prepared” should be taken to heart. Most major airlines now have power outlets at the passenger seats. Before your flight you can look at the airline website or SeatGuru.com to see if the aircraft you will be flying on has power outlets. But don’t depend solely on them to charge your phone, tablet, computer, etc. On one of my flights this week the plane did have power outlets in every row but there was no power supply to them! No one was able to charge their devices unless they brought their own power bank. If you’re looking for a dependable power bank, the one I use it this one by Jockery. It not only keeps my iPhone going, but actually recharges it to 100%. I can get three full charges for my iPhone before having to recharge the power bank. It is also powerful enough to charge a tablet. If you are taking a flight that is supposed to include a meal, you don’t have to bring an entire meal to bring with you. But you should always bring at least a few snacks just in case. I have seen catering fail to bring enough meals to the plane, meals fall on the floor in turbulence, and frozen or burned meals cause passengers to not have their expected food to eat on a flight. A lot of the flights I work have food for sale in the main cabin. Often we run out of food to sell by the time we reach the rear of the aircraft. It’s always sad to have to tell someone hoping for a nice sandwich that we are out of everything but gummy bears. As a flight attendant I always carry a stash of tasty protein meal replacement bars. When I’m traveling as a passenger with my kids I always bring a small cooler with food and snacks. Some ideas for good food that travels well can be found here and here and here. You never know what the temperature will be like on the aircraft. Even though the flight deck has temperature controls and on some aircraft the flight attendants have some control, the airplane doesn’t always cooperate. On some airplanes it may be hot in the front and cold in the back (or vice versa) and in spite of attempts to balance the temperature, nothing works. I was on a flight recently as a passenger where it was literally 60 degrees Fahrenheit and although the flight attendants called to request the heat be turned on many times, nothing ever worked. I did have a sweater with me, but even that wasn’t warm enough. I’m usually hot on flights so it was really saying something when, out of desperation, I pulled my long sleeved surf shirt out of my luggage and wore that over my regular clothes to help stay warm. Most U.S. domestic flights no longer provide blankets in main cabin, so it’s best to bring something with you. Even if you’re in a premium cabin where blankets are provided, you never know what could happen. Drinks could spill on your blanket; you might open the protective bag to discover the blanket wasn’t washed or was washed but is still damp; or cabin service may make a mistake and forget to place blankets on your plane. It doesn’t happen often, but it does happen. Most major airlines now provide some source of entertainment, whether it is video in each seat, video on overhead screens, or access (either paid or free) to the internet on your personal electronic device. But these systems sometimes fail. I often see passengers who travel with nothing to keep occupied, depending on the in-flight entertainment they have come to expect. Then if there is a mechanical issue and that entertainment isn’t available after all, they get angry. On one of my recent flights the video system was inoperative. One passenger said, “So what I am supposed to do, just sit here for five hours?” It is nice when the airline provides entertainment, but depending on it as your sole source of entertainment is a mistake. Toss a magazine, Puzzle Book, Tablet, Coloring Book, or something in your bag to occupy your time in case the provided entertainment falls through. This is especially important when you are flying with children, as most airlines have little, if anything, to keep children entertained. If you are traveling with young children and forget your toys and entertainment items, read my idea for a DIY travel toy in this post. You can also have a “scavenger hunt” using the inflight magazine. Don’t get stuck twiddling your thumbs for the entire flight! Bring something to do prevent extreme boredom. Even if you’re not planning to sleep on your flight, you may find that due to a delay or other off-schedule event you need some peace and quiet. Although cute, it is not the job of parents flying with babies to pass out earplug “goody bags” to other passengers. (Read here to see what I’m talking about.) Be prepared and pack some ear plugs and eye shades in your travel carry-on bag. You might not use them often, but you will be glad you have them on those occasions where they are needed. My favorite eye shades are the kind that don’t push against your eyes. This pair by Madison Garden looks great and comes with earplugs and a travel bag. What do you think? Do you usually pack these items when you fly? Was there ever a time you didn’t pack one of these items but wished you had? I love to get comments and do my best to reply to each one. Comment below or on our Facebook, Instagram, or Twitter page.